Using the HAMR technique, biologists identified modifications on RNA associated with degrading molecules. RNA, once thought to be a mere middleman between DNA and protein, is now recognized as the stage at which a host of regulatory processes can act to allow for flexibility in gene expression and thus the functions of cells and tissues. In a new report in the journal Plant Cell, University of Pennsylvania biologists used material from both humans and plants to examine chemical modifications to messenger RNA, or mRNA, finding that the modifications appear to play a significant role in the process by which mRNAs either survive and become translated into protein or are targeted for degradation. Their analyses also revealed that mRNAs that encode proteins involved in responses to stress were more likely than other mRNA molecules to be modified, a hint that the modifications may provide a mechanism by which organisms can respond dynamically, at the post-transcriptional level, when confronted with changes to their environment. The research was led by Brian D. Gregory, an assistant professor in Penn's Department of Biology in the School of Arts & Sciences, and Lee E. Vandivier, a graduate student in Gregory's lab. Coauthors include Rafael Campos and Ian M. Silverman from the Gregory lab, and Pavel P. Kuksa and Li-San Wang from Penn's Perelman School of Medicine. The snapshot of all RNA sequences present in an organism at one time is known as the transcriptome; in this study, researchers wanted to examine the epitranscriptome, or modifications to the sequences of RNA molecules that may go on to affect gene expression. Gregory has pioneered new techniques to investigate how RNA is regulated, including a method that identifies the sites of interaction with RNA binding proteins, called PIP-seq. 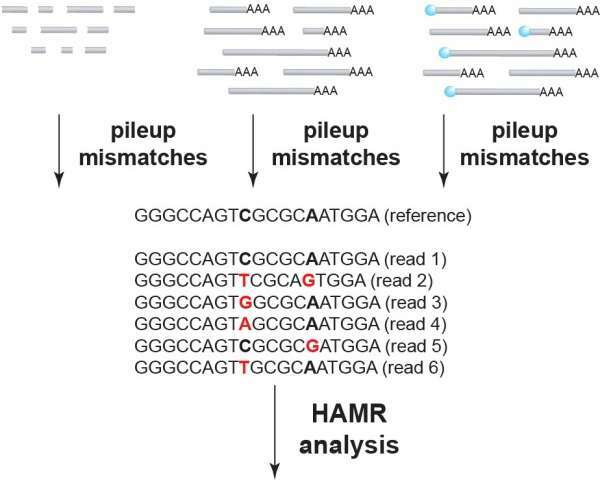 In this study, he, Vandivier and colleagues used another technique that Gregory and Wang together devised, called HAMR, for high-throughput annotation of modified ribonucleotides. The approach allows for the identification of nucleotides in RNA molecules that have been modified after being transcribed from DNA. "With these changes you're increasing the potential chemical properties an RNA molecule can have," Gregory said. "Instead of just having A, C, U and G, you have almost every variation you can think of. " Earlier work has found more than 100 of these types of covalent modifications, primarily in RNA molecules that do not code for proteins, such as transfer RNA and ribosomal RNA. In this study, however, the researchers wanted to look at modifications in messenger RNA, the transient molecules responsible for translating a particular sequence of nucleotides into specific amino acid sequences to build proteins. Using the HAMR technique, the team investigated the epitranscriptome of two human cells lines as well as of immature flower buds from Arabidopsis thaliana, the quintessential plant model organism. They looked specifically for modifications that change the Watson-Crick base pairing edge, or the edge responsible for mRNA's ability to base pair. They performed the HAMR analysis on three different libraries of RNA gathered from earlier investigations: one comprised of small RNA, one of polyadenylated RNA, which are considered stable, and one of RNA that was in the process of degrading. Of the three sets, they found that the degrading mRNA library had a preponderance of modifications compared to the other two, suggesting that the modifications either caused or were a consequence of being marked for degradation. "People probably weren't thinking about these modifications because they weren't thinking about degrading RNA molecules," Gregory said. "But we should be, because degrading an RNA molecule is how you regulate it. When you want to stop making a protein, you degrade the mRNA." In stable RNA molecules, the researchers discovered that these type of modifications tended to be found in regions of alternative splicing, an occurrence where by a single gene can be cut and pasted together in various permutations to code for a variety of different protein variants. "We see a lot of modifications that lie right over those elements within the intron that are necessary for splicing," Vandivier said. "Theoretically, these modifications might be messing up the splicing machinery. That's something we'd like to explore further, as alternative splicing can play a role in a lot of human diseases." As a final test, the team performed an analysis to see what types of mRNAs were particularly enriched for modifications by taking the subset of mRNAs that were found to be modified through their HAMR analyses, and comparing them to the total pool of expressed mRNA transcripts. "We saw a lot of enrichment in this subset for genes that are involved in stress response as well as cell cycle control and apoptosis," said Vandivier, a suggestion that the modifications, in both humans and plants, are linked to genes that must be tightly regulated and able to be marked for degradation when appropriate. The researchers noted that their findings, while illuminating, represent the tip of the iceberg when it comes to the potential power of studying RNA regulation using high-throughput and computational techniques. "A simple library of RNA can contain many hidden layers," Vandivier said. "With these new high-tech approaches we have ways of mining the data we already have to find out more." "This study is a great example of how important computer-aided analysis are in the biological sciences," said Gregory. "Technology is really driving where we can go with science these days." In ongoing studies, the Penn team is trying to determine how these modifications are made, whether they are the cause or a consequence of an mRNA molecules being targeted for degradation and to further investigate their functional consequences.